Slaughterhouse: slaugh·ter·house (slôtr-hous): n. A place where animals are butchered. The numbers are in. 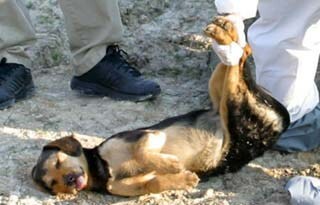 In 2011, People for the Ethical Treatment of Animals (PETA) impounded 760 dogs. They killed 713 of them. Only 19 were adopted. An additional 36 of them were transferred to kill “shelters” where their fates and the fates of those animals they displaced are unknown. In 2011, they impounded 1,211 cats. 1,198 were put to death. A paltry 5 of them were adopted and another 8 were transferred to kill “shelters” where their fates and the fates of those animals they displaced are unknown. They also took in 58 other companion animals, including rabbits. 54 were put to death. Only 4 were adopted. All told, 2,029 companion animals were impounded. 1,965 were put to death. Only 28 were placed in homes. That’s a 97% rate of killing. If the animals transferred to kill shelters were themselves killed or displaced other animals who were then killed to take in the ones from PETA, the death toll could be as high as 99% (2,009 of the 2,029 animals they impounded). Only 1% were adopted into homes. While the No Kill movement is having unparalleled success and with No Kill communities now dotting the American landscape—in California, Nevada, Michigan, Kentucky, New York, Texas, Virginia, and elsewhere—PETA continues to be little more than a slaughterhouse. This is about something more nefarious. This is about something truly insidious. Over five years ago, I wrote a blog opining that the reason PETA slaughters virtually every animal it seeks out and “impounds” has more to do with Ingrid Newkirk’s dark impulses than with any ideology, philosophy, or belief in overpopulation. This followed a staggering 97% kill rate for animals in 2006, despite millions of animal loving members, a world-wide reach, and a budget of tens of millions of dollars. It followed the killing of 1,942 out of 1,960 cats they impounded. It followed the deaths of 988 out of the 1,030 dogs they impounded. It followed the killing of 50 of the 52 rabbits, guinea pigs, and other animals they took in. It followed the killing of the one and only chicken they impounded. That blog earned me a letter from PETA’s attorney threatening litigation for defamation. Then came 2009: only 8 adoptions, less than 1/2 of 1% of the animals they took in. Killed: 2,301 out of 2,366. In 2010, they killed: 1,507 of the 1,553 cats. Killed: 693 of the 792 dogs. And now in 2011, the death rate remained a staggering 97%: 1,965 of the 2,029 companion animals they took in. In the last decade and a half, they have killed over 25,000 animals: that’s roughly 2,500 animals a year every year; or over five animals killed by PETA every single day. PETA has argued that all of the animals it kills are “unadoptable.” In fact, PETA’s attorney stated that in his letter threatening a defamation lawsuit if I did not back down. But this claim is a lie. It is a lie because the numbers historically come from the State of Virginia’s reporting form which only asks for data for animals taken into custody “for the purpose of adoption.” It is a lie because PETA refuses to provide its criteria for making that determination. It is a lie because rescue groups and individuals have come forward stating that the animals they gave PETA were healthy and adoptable. It is a lie because testimony under oath in court from a veterinarian showed that PETA was given healthy and adoptable animals who were later found dead by PETA’s hands, their bodies unceremoniously thrown away in a supermarket dumpster. It is a lie because, according to the Daily Caller, “two PETA employees described as ‘adorable’ and ‘perfect’ some of the dogs and cats they killed in the back of a PETA-owned van.” And it is a lie because Newkirk herself admitted as much. Why does the animal protection movement tolerate this woman? No other movement would allow someone to remain in her position without a massive outcry and public condemnation when their actions are so counter, so anathema to their movement’s foremost principles. The child protection movement would not allow someone who kills children to run an organization dedicated to children’s rights. The human rights movement would not allow someone who kills people to run any of their organizations. But the animal rights movement—a movement founded on the principle that animals have a right to life—allows a very public, avowed, shameless animal killer to run an animal rights organization. And without exception, the rest of the nation’s national animal rights groups remain deafeningly silent about it. As if that was not shameful enough, others go further and actually embrace her. While the Animal Rights Conference inducted her into their Hall of Fame, Wayne Pacelle and HSUS have allowed her and her pro-killing apologists to give workshops at their national conference. So here it is again: Round 6. Munchausen by PETA. My opinion.